So I'm not going to lie, the fishing has been slow this year. I got out for one good trip to the salt in which I got skunked, but still managed to have a good time. Earlier in the season I got out to the local ponds and caught some small bass and pan fish on fly, but they were pretty small and I seemed to lose interest pretty quickly. Catching bonefish does that to you with the little guys. Each year my New Years resolution has been to fish more, and this year is not looking good. Me and the family built a house and that seems to be consuming most of my time, plus the kids are at the age where they can't quite go fishing but certainly don't want daddy to leave them behind. This predicament should bolster my argument for a "family" boat (Hells Bay, makes a family boat, right? I believe it's called a Marquesa :)), but all I get are strange looks when I bring that up. The good news is that my trip for next year is booked and it's going to be tarpon in the keys. It should be a blast as I haven't been to the keys in several years so it's time to head back. Until then, here's a pic from the grill last night. 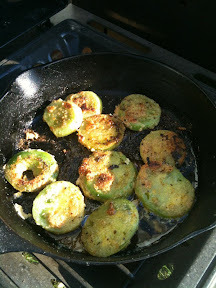 What good southern boy doesn't fry up home grown green tomatoes. Could it signal the end of times? Or could it just be coincidence? Whatever it is, imagine hundreds of tarpon leaping at once.You decide. Wish I could have seen this one.